A couple weeks ago, I took an overnight trip to Nagoya. I got a late start, putting me in town around 1 p.m. But that was fine, since I was spending that whole day just going from card shop to card shop. My first stop was CAPS, a former Mint shop that will be closing down in the next few months. They're slowly clearing out a lot of their singles, though apparently they plan to keep some sort of online business going. I picked up a lot of good cards there, but most importantly and confusing were these bromides. I can't identify them. I can't tell you much about them, but if you know anything to add to them, let me know! Note: the measurements are being made with my iPhone app, so they might not be very accurate. This card is about 9 cm wide and 13 cm long. There are no markings or borders at all, and the back is white. I have no clue about the player, though it is obviously a Yomiuri Giants player. This is Michio Nishizawa, who is pictured with the Dragons. He played with them his entire career, though I'm guessing this card was issued sometime from 1947-1958 (his final season). Nishizawa started as a pitcher, even throwing a no-hitter, but eventually left the mound and developed into a pretty good hitter. He went on to manage the team for a few years, compiling an over-.500 winning percentage. 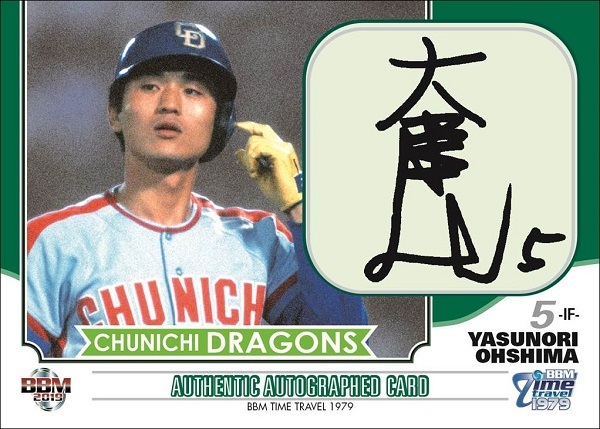 He's in the Japanese Baseball Hall of Fame and his number, 15, has been retired by Chunichi. This card has a white or off-white back. You can see the border and the horizontal, white text on the front. It measures about 8 cm by 10 cm. Makoto Kozuru is another Dragons player who is now in the Hall of Fame. He played with the Dragons from 1942-1943, and 1946-1947. Like Nishizawa, this card has a white back. The image is colorized, with a green background, red shoes, and yellow socks. I believe it's about 7 cm by 11 or 12 cm. Finally, this colorized card has a yellow border, though it doesn't show up well in my scan. The text at the bottom looks more like type, where the other cards have text that looks handwritten. It has a tan back, and is printed on thinner stock than the others. It measures about 9 cm by 14 cm. The player featured is Michinori Tsubouchi, another Dragons player. He was with the team from 1949-1951 as a player, though also managed the team through 1954, and again from 1965-1967. He, too, is in the Hall of Fame. I wasn't able to identify the cards looking through Engel's guide, but I might have missed something. Regardless, they're neat cards, and given their sizes, are probably prize cards from various sets. And at least three of the four are hall of famers! And I got one more big bromide, but it's so big I couldn't scan it. That one has Shigeru Chiba, who is also in the Hall of Fame, so I'm at least four for five. BBM's first 2019 set was released in late 2018. American card collectors might understand this concept, since manufacturers rushed to release the first sets with the prior year's stats as quickly as possible. I remember finding cards with prior-year statistics before Christmas in the 1990s. Of course, a lot of that changed around 2006 or so, when the MLB started setting some rules on card releases. These days, the year's first release is a flagship - 2019 Topps came out recently, and 2019 Donruss will be out soon. Some manufacturers (Leaf, mainly) seem to issue some sets into the next year; there are still some "release-pending" 2018 issues six months into 2019. But in Japan, BBM issues its first 2019 sets long before its flagship. Both this set and Glory came out before New Years, the annual retirement set came out this month, and Rookie Edition is either out now or will be out very soon. In fact, a couple of BBM's team sets might be released before the flagship First Version. Time Travel focuses on a particular year in the past; if you haven't guessed from the title, the 2019 set goes back 40 years to 1979. This is BBM's only "throwback" set. I really look forward to this set every year, mainly because of the throwback design and the inclusion of some pop culture references. It's a nice replacement for the Historic Collection sets BBM used to do. And it must be pretty popular, as it is always a bit difficult finding a full set at a reasonable price. Base cards use a brown card stock with very little gloss. Backs use just one color, similar to menko cards of the era. The regular cards are #1-72. Six players who retired in 1979 are featured in the first subset (#73-78). The next eight cards are titled 1979 Retrospective (#79-86). I'm sure you can guess the topic of "Born in 1979", card #87-92. The final four cards look at society in 1979. While pop culture is featured, this NEC computer got its own card as well. Moving on to inserts, we get to the Title Holders series. There really isn't much difference between the Central League Title Holders and Pacific League Title Holders sets. Each set has nine cards, and both have parallel versions #/30. The only premium insert in this release are autographs. Those are #/90 or less. I don't have a copy of one yet for my collection, so the above photo is a promotional image from BBM. From time to time, cards and/or sets don't properly get added to my lists. As accurate as I try to be, my type collection is missing plenty of listings, I'm sure, and I know my inventory isn't always accurate. One set that isn't quite right is BBM's 2000 O-N box set. The set was originally sold for 30,000 yen, which is about $300. Each set came with a 54-card set, and actually, there were two versions. You can read about the two versions, and NPBCardGuy's adventures with the set, here. This is #ON-B26. It comes from the Basic set. This card was sent to me by NPBCardGuy, and it's my first and only card from the set. I now need to chase down a regular base card of the basic and limited versions of the set... or just get the whole set. However I might do that. Every card in my type collection is technically equal. My 1989 Topps base card is just as important to finishing my collection as a 1/1 Babe Ruth autograph. In fact, since I focus most on base cards, followed by inserts, I would argue that the '89 Topps nickel box single is more important. But nickel box singles are a dime a dozen. And mainstream cards aren't so hard to find; even "rare" parallels and inserts can be found online somewhere. It's the regional and team issues that I find most challenging to locate. And in Japan, I'm pretty sure the vast majority of them are uncatalogued. So these team issues are more exciting to find, even if they are "equal" to the base cards. This is 2017 BayStars B*Spirit. B*Spirit is the BayStars fan club. Most team issues in Japan are issued through the fan clubs, though some teams (including the Eagles and BayStars in 2018) issue their own regular sets, and other teams (especially the Giants) distribute cards as stadium giveaways. The card has an interesting holographic foil coating, which showed up in my scan. Each card has four different photos, and the season slogan can be found on the back. The 2018 B*Spirit set only has two photos, but both are full-bleed images. And this year has statistics. The front of Yamasaki's card commemorates three years of 20 saves per season. Team Venus is the name of the Yomiuri Giants cheerleading squad. I don't know who exactly issued this set or how it was distributed, but thanks to Anna's signature including the year, we can see that it was issued in 2015. The back has a bunch of little facts, like what she recommends at Tokyo Dome and her catchphrase. It seems to be a requirement that every celebrity, mascot, and performer in Japan must have their own catchphrase. The final three cards were issued by the Swallows in 2008. They are parallels, as noted below. The base card is similar to most trading cards. It reminds me a lot of the cardstock Hits uses for its idol cards and oddball sets. And Hits has issued a few Swallows sets recently that make me believe they were the printers. Base cards have Y prefixes in their card number. Holofoil parallels have a busy coating on the front similar to the BayStars card at the top of this post; you can probably make out the pattern in the scan. Holofoil parallels have Ys prefixes. Finally, I have this black printed signature - it's a facsimile signature. These have YsS prefixes. Yesterday's post didn't even begin to show you all of the MLB cards I got at the card show last month. But I don't want to bore you with simple inserts that I don't have a story for. Heck, I rarely have a story for most of the cards I get. But I found some NPB cards, too. Other than the newest sets and recent parallels, finding NPB cards I need is getting much more difficult. My NPB type collection is much more complete; my MLB collection is under 30% while NPB is over 50%. For both, it's the hits, rare parallels, and oddballs that remain. NPB just has fewer of the former two. It doesn't mean I get shut out when I go card hunting. Royal Purple was a rare (#/50) insert found in a few 2018 pack-based team sets released by BBM. I was happy to get these two, from the Carp and Fighters team sets, especially at reasonable prices. The annual Icons box set comes with a few rare inserts of its own. The die-cut and printed autograph sets eventually end up becoming affordable, and it was this show that such a thing happened. Rookie parallels! I've said it before, but Japanese shops and dealers often assign premiums to rookie cards, even if the player is a flop. Luckily these parallels were priced properly. There's only one autograph in this lot, and you're looking at it. I'm probably going to have to start hunting for hits to continue making progress on my type collection. I added a few foil signatures, though. And here are both versions from the Pacific League Rookies set. 2018 Epoch Lions Seasons Achievements regular and parallel. Epoch issued a ton of higher-priced sets this year in addition to the budget team issues. I do miss the full-set box issues, though. One single die-cut insert from the 2017 Rakuten Golden Eagles team-issued set. Depending on how things go this year, I would really like to visit Sendai and try to pick up some cards from this annual release that I haven't come across. How did I miss a regular insert card from a regular BBM pack-based team set on my first go-round? It's the Giants, so there you go. I'm sure the parallels of this card look awesome, but this foilboard regular insert doesn't look that great. I found this promo card flipping through a big box of cards! And this insert was nearby. I got all of the three Giants cards above at the shop near Ueno Station, and this Kiyohara was the priciest of all the cards I got there. Even so, it was cheaper than "book" price, so I was certainly happy with the cost. I mentioned oddballs are tough to find. Around 1998-2001, there were some sets issued by manufacturers other than BBM and Calbee for individual teams or the entire NPB. Power League and Upper Deck's sets aren't impossible to find, but they're certainly less common than the Big Two. And don't get me started on the game cards. Baseball Heroes (above) and Owner's League are tough issues to track down. I believe there are still half a dozen cards I need for Owner's League, and there must be a couple dozen Baseball Heroes singles I don't have as well. And that's just for my type collection. Tanishige and Rami-chan both appear on several cards in both series, and I haven't made much headway there in quite a while.